Learn how to quickly set up your Square Stand, secure it to your counter and connect hardware accessories. Place your iPad into the Square Stand by inserting the connector on the iPad firmly into the connector on the stand. When the iPad is properly connected, you’ll be prompted to download the Square app, if you haven’t yet done so. Secure your iPad to the stand by inserting the security pin. Plug the hardware hub into the stand and power adapter. The hardware hub is the small rectangular component with three USB ports that links your Square Stand to the power adapter. Plug the power adapter into a grounded AC outlet. Secure your stand to a counter using the drill or adhesive mount included in the package. Note: Because the Square Stand is a piece of electrical equipment, please make sure you mount it somewhere that is not frequently wet. Mark the spot on your counter where the stand will be positioned. The maximum countertop thickness is 1.75 inches. If your countertop is thicker than 1.75 inches, you can use the adhesive plate to secure your stand. Use the enclosed drill bit to drill a hole in the counter. Insert the power cord into the bottom of the stand before attaching the mount plate. Confirm that the stand is locked in position before attaching it to your counter. Be sure the drill plate is tightly attached to the bottom of your stand. 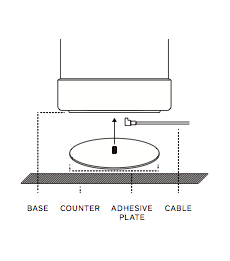 If the plate isn’t completely attached, your stand will be off-centre. Take note of which way the stand is intended to rotate, and make sure there are no obstructions. 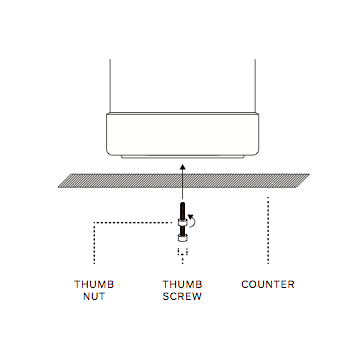 Drive the thumb screw through the bottom of the counter and into the base of the stand until the screw bottoms out. Twist the thumb nut until it presses against the bottom of the counter. Note: If needed, you can add an additional hex nut. We recommend using a 6-sided hex nut, which can be purchased at any hardware store. Clean the area of your counter where the stand will be secured and wait for the surface to dry completely. Insert the power cord before attaching the adhesive mount plate to the stand. Screw the enclosed adhesive plate into the bottom of the stand. Be sure the adhesive plate is tightly attached to the bottom of your Square Stand. If the plate isn’t completely attached, your stand will be off-centre. Confirm that the stand is in the lock position. Remove the paper backing from the adhesive plate. Stick the stand onto the adhesive and firmly press down. Wait 30 minutes for the adhesive to set. Remove the security screw using the security screwdriver included in the original box. 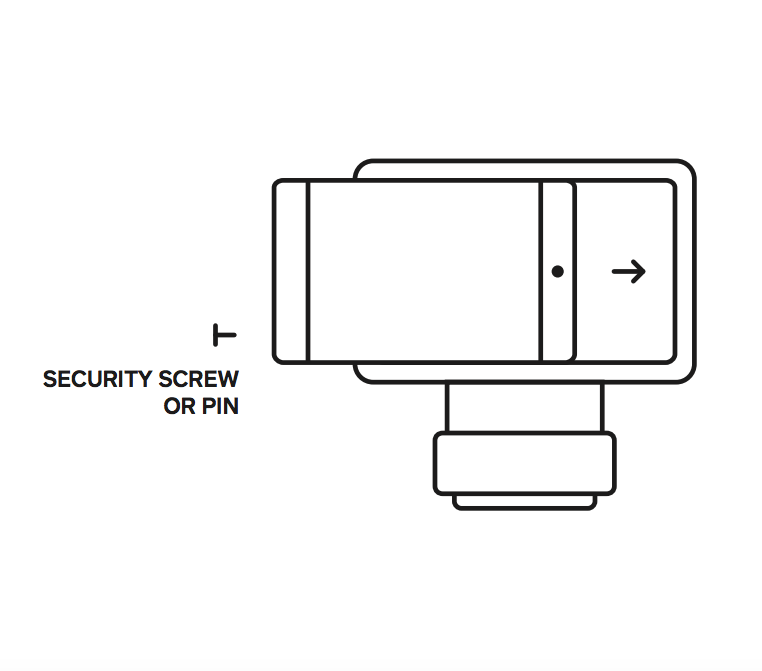 If you are using the Square Stand for Contactless and Chip, simply remove the pin. Press the eject button located on the underside of the iPad enclosure.